The holidays may have come and gone, but we still have one more gift to share with you this New Year, the results of the seventh annual BAB Awards. 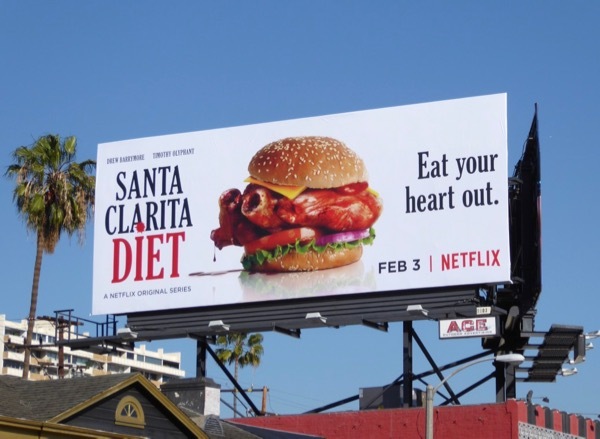 Throughout the year Daily Billboard tries to shine a light on great outdoor ad creatives, cool out-of-home advertising gimmicks and eye-catching billboards that have really stood out from the rest in L.A.'s sprawling skies, but these are are our top picks from the last calendar year from the worlds of TV, film, fashion, music, drinks, food and more besides. Enjoy and let us know what you think of our choices and if you were involved in any way. 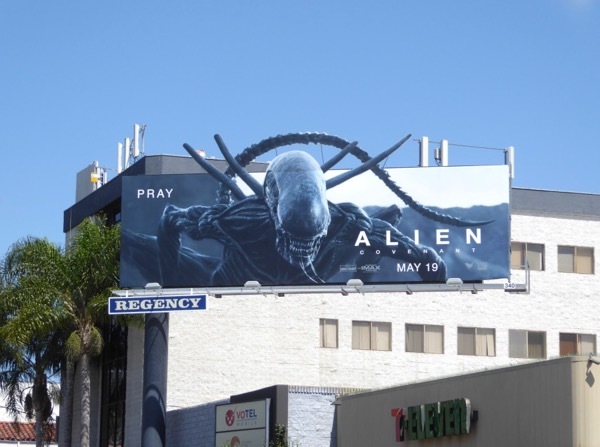 One of Daily Billboard's favourite ads in 2017 was this Alien: Covenant special extension cut-out. 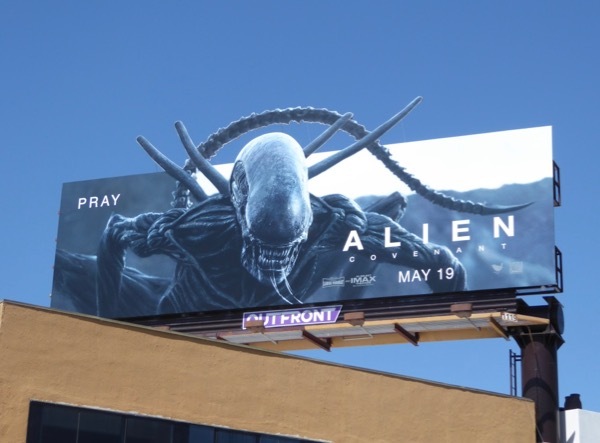 It gave Alien fans exactly what they wanted to see (even if the film itself failed to live up to expectations), a drooling xenomorph in all its gruesome glory stalking the city streets and skies in May. Meanwhile this year's BAB Award runners-up in this category include this Spider-man: Homecoming billboard where he holds together the bulletin in a similar way to the Staten Island Ferry, this winged Pepita billboard for Coco and this sporty Angels of Anaheim baseball billboard. 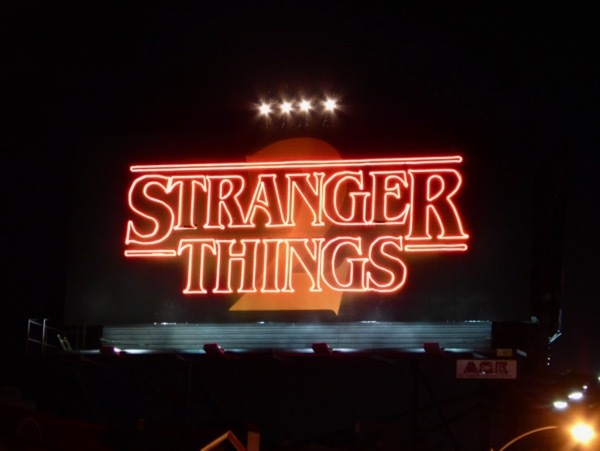 In the world of TV the second season of Netflix's hit show, Stranger Things, was given some extra standout with this fantastic neon sign billboard installation which perfectly evoked the series title treatment. 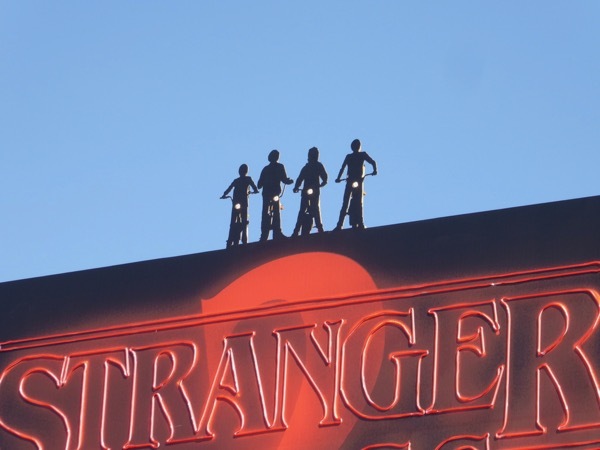 Netflix had already used this neon embellishment for their Emmy consideration campaign for the debut season, but for the sophomore season they added some silhouetted cut-outs of the kids with bike lights atop the billboard that added extra interest to the installation. 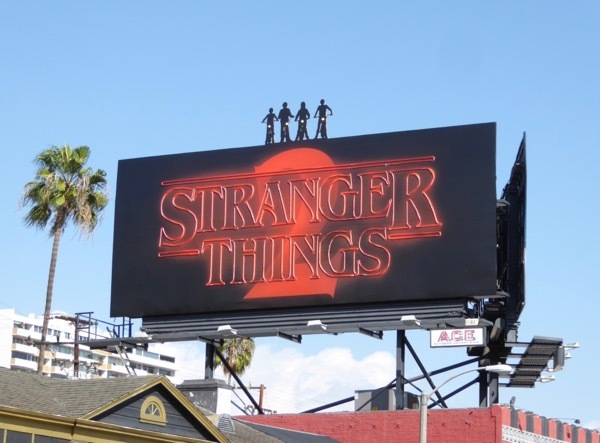 These cool billboards were spotted above the Sunset Strip and L.A.'s 3rd Street towards the end of October 2017, perfectly timed for Halloween. 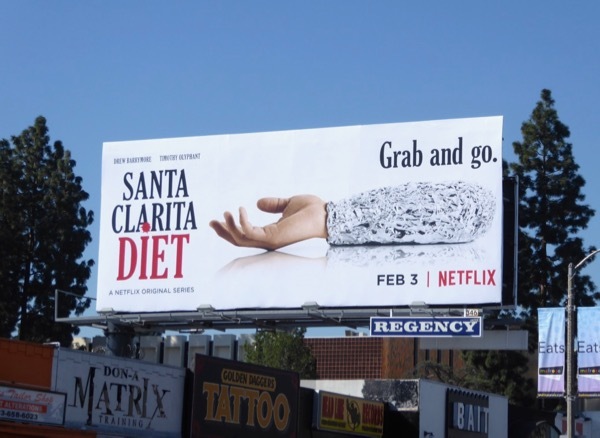 Other great out-of-home gimmicks gracing L.A.'s skyline this past year included this Disjointed neon billboard with moving hand, this Julie's Greenroom 3D curtains billboard and this Queens of the Stone Age glowing devil eyes billboard. 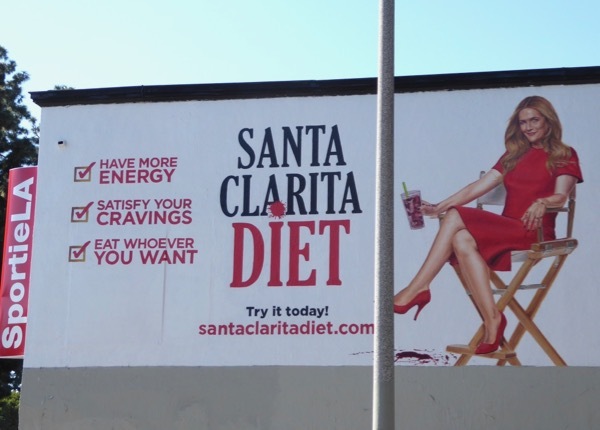 The streaming service also knocked it out of the park with this fun outdoor ad campaign for their zombie comedy, Santa Clarita Diet, at the start of 2017. 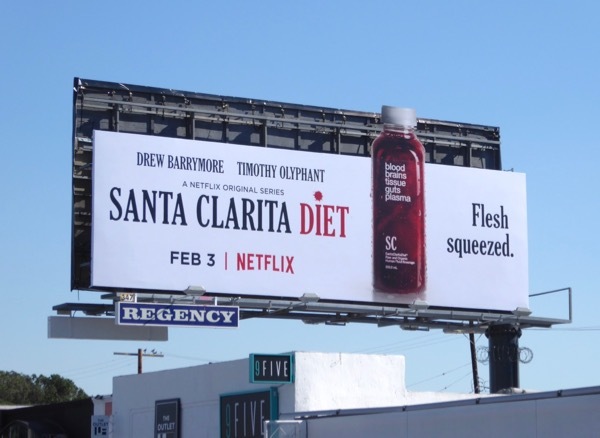 Raw heart burgers, finger fries, burrito arms and bloody flesh squeezed juice certainly got passersby to look twice, although maybe they're not the best billboards for the squeamish. 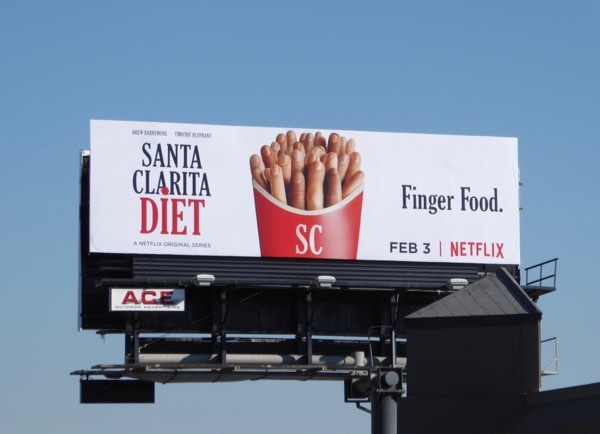 These gruesomely witty billboards were spotted around the streets of L.A. in January and February 2017 and are more than deserving of the BAB Award for Best Television Billboards. 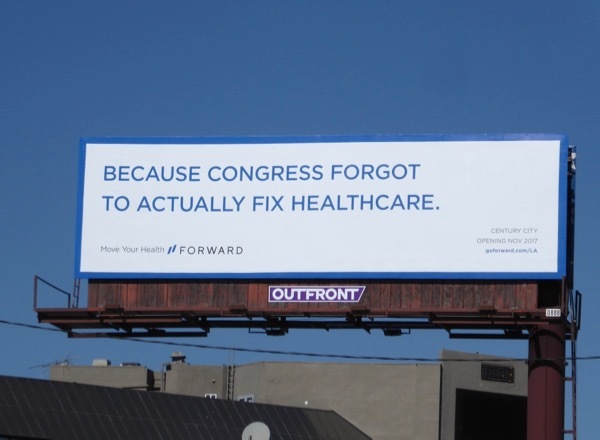 Other strong contenders in the television category this past year were these American Horror Story: Cult billboards, these billboards for The Handmaid's Tale and these billboards for The Opposition w/ Jordan Klepper. 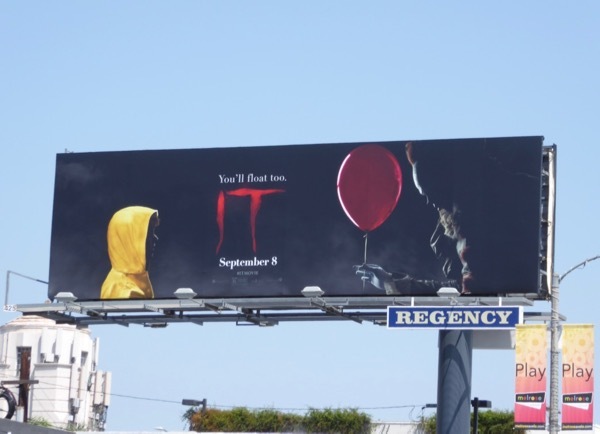 The film billboards that instantly come to mind from last year have to be these striking ads for the IT movie. The simplicity of their red balloon imagery are innocent and sinister at the same time. 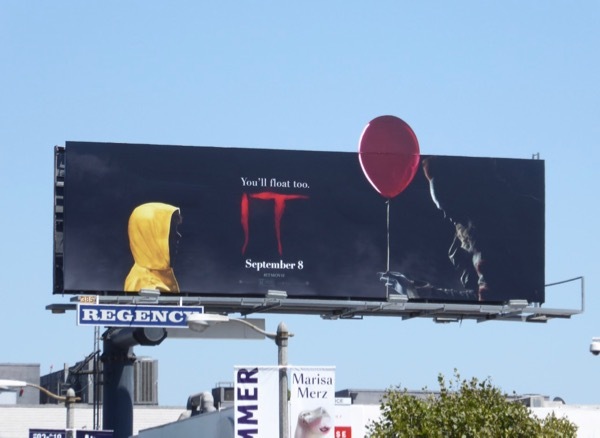 These billboards creeping out the summer skies translated into box office success too, helping make IT the highest grossing horror flick of all time. 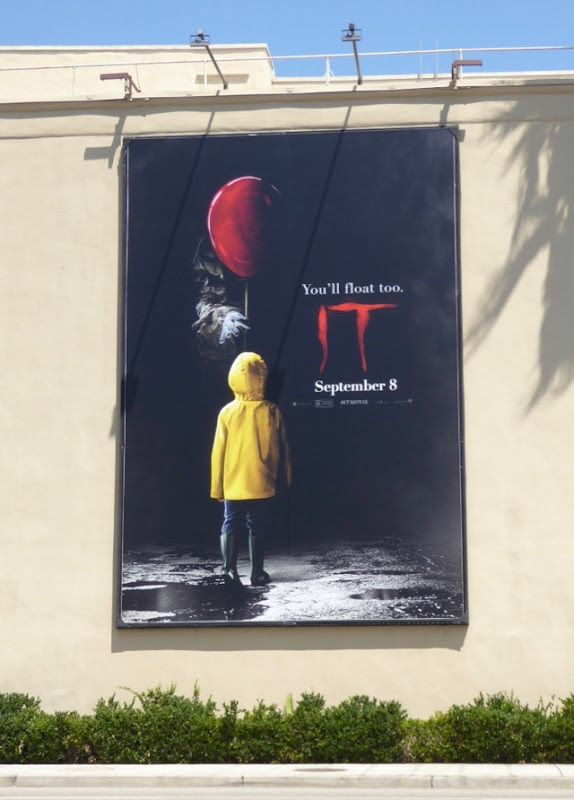 Other cool theatrical release outdoor ad campaigns from 2017 include these Logan movie billboards, these Atomic Blonde movie billboards and these Kong: Skull Island movie billboards. 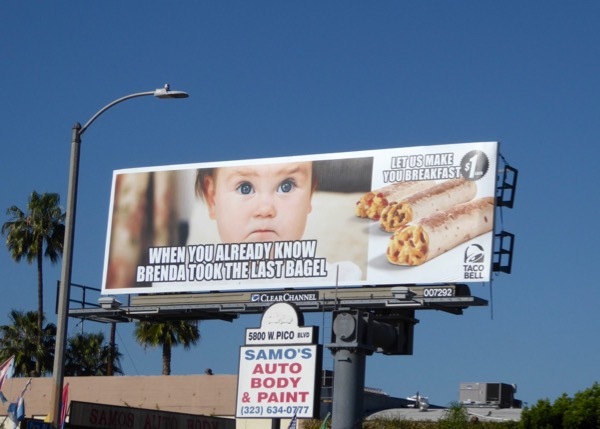 These spring 2017 billboards from Taco Bell may not be the most sophisticated advertising, but they perfectly fit with the fast food chain's busy customer base, and who can resist a cute baby meme to put a smile on your face. 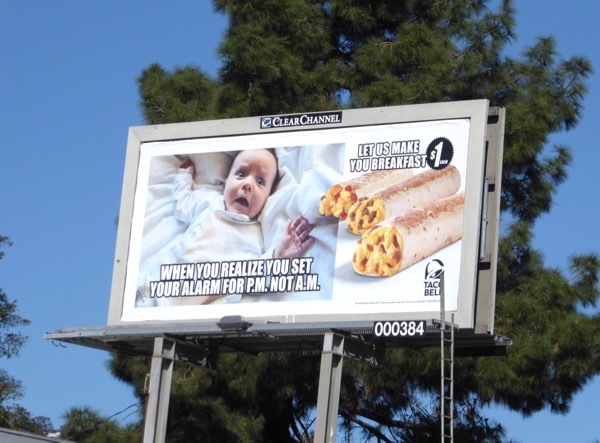 Other notable food BAB Award contenders in 2017 had to be these Chiquita bananas billboards and these Chipotle billboards. 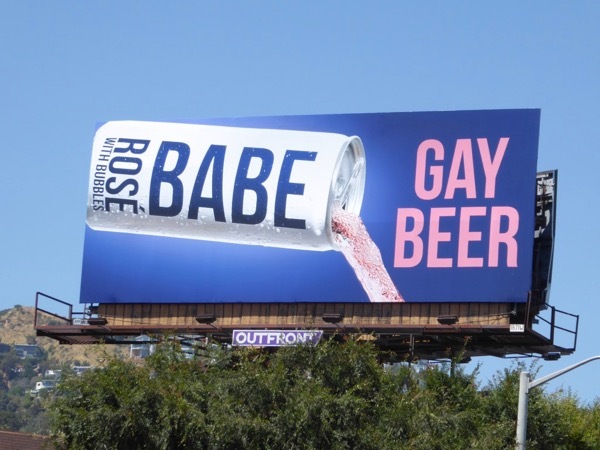 This 'Gay beer' billboard for Babe Rosé with Bubbles made us laugh out loud last spring. 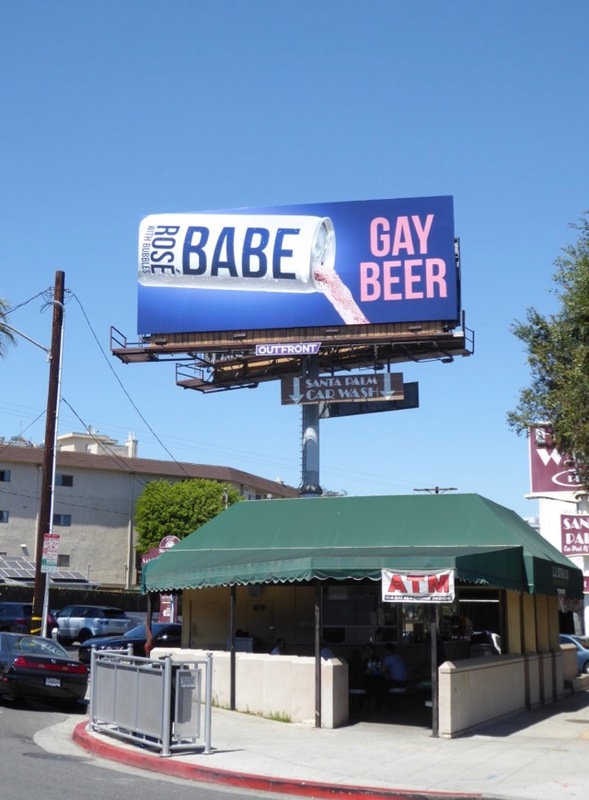 The ad perfectly positioned in the heart of West Hollywood's gay community is bold, witty and totally knows its audience. Other shortlisted drinks outdoor campaigns this year included Corona Extra's A beach on every can billboards and these Health-Ade Kombucha special extension billboards. 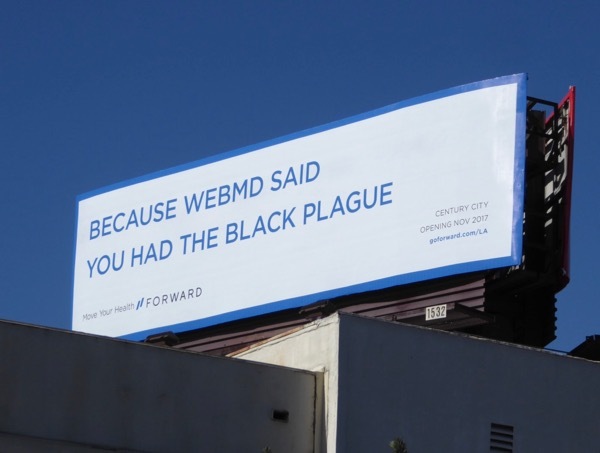 This copy-only billboard campaign for California's primary healthcare startup, Forward, was a clear winner in this category. 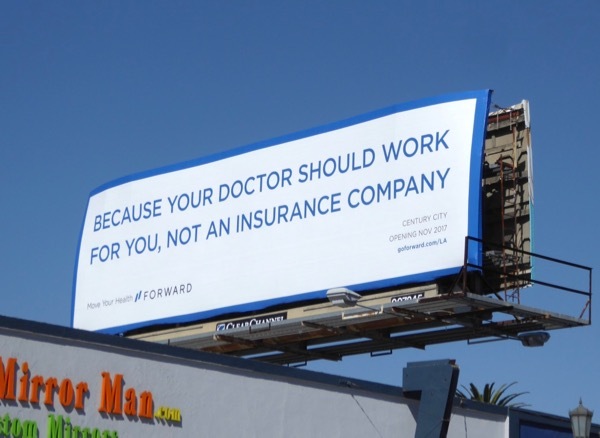 Health issues can be a tricky subject matter to visually convey on billboards, so these simple ads cleverly did the job with words. 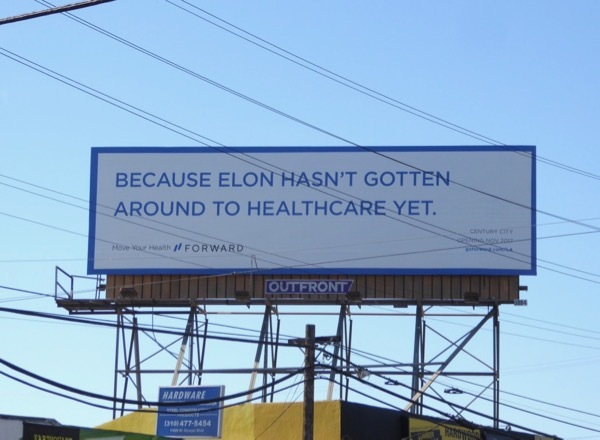 The engaging ads filling the fall skies were funny and topical, with a few zingers aimed at Congress and tech inventor Elon Musk. 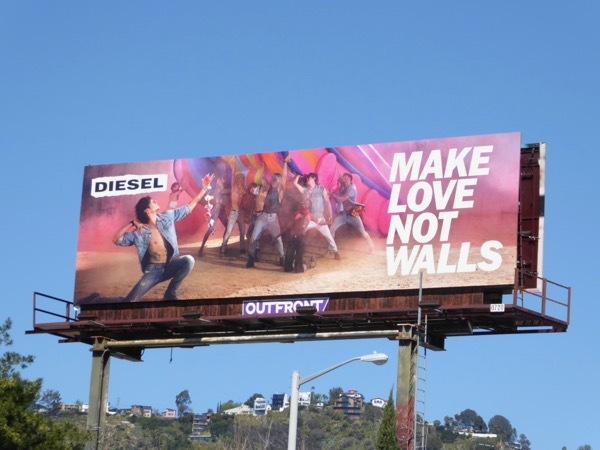 In the world of fashion, Italian denim brand Diesel captured the spirit of the nation (and world) back in spring 2017 with this joyous 'Make love not walls' billboard, trolling Donald Trump and his economically unpopular and divisive Mexican Wall and tapping into its youthful and more progressive consumer. A close runner-up this year were these Calvin Klein Underwear billboards featuring the Moonlight movie actors. 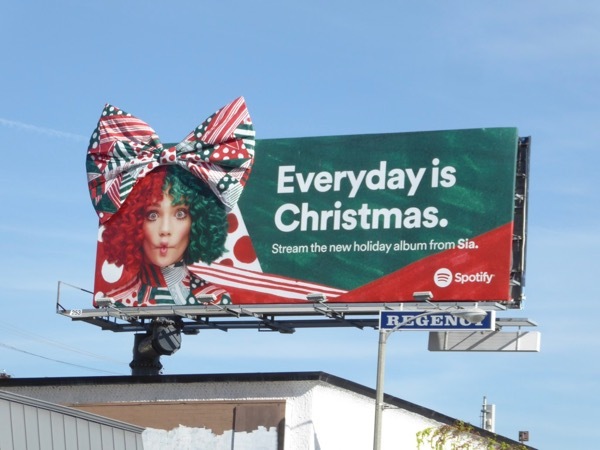 Spotify stole the crown in the music category this year with these fantastic embellished 3D bow billboards for Sia's new holiday album, Everyday is Christmas. 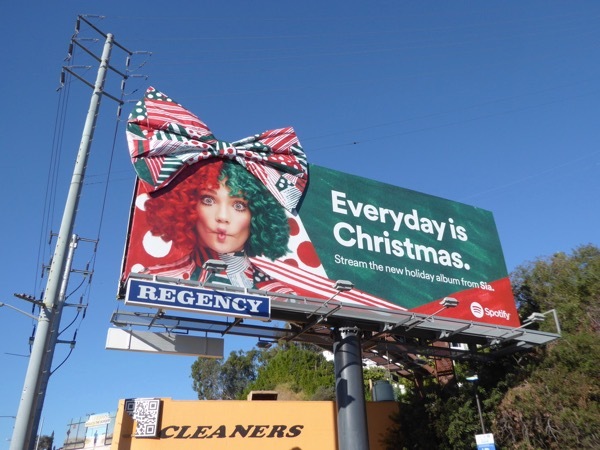 Featuring Sia's dancing collaborator, Maddie Ziegler pulling a funny face, rather than the singer herself, they appeared mid-November just in time for the festive holiday season and made a colourful impression along the rocking Sunset Strip. 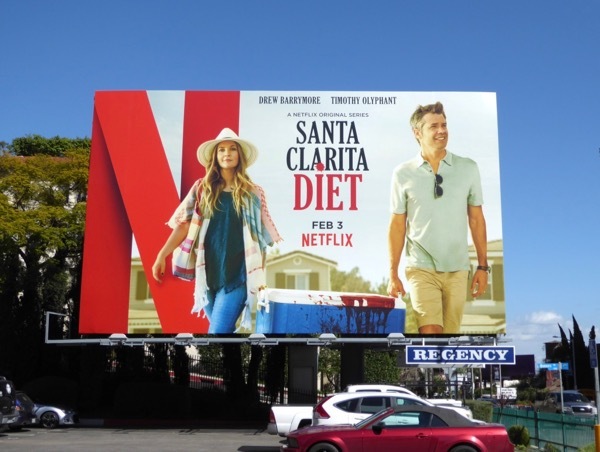 Other music-themed billboards that stood out this year was this giant Britney Spears billboard for The Nineties docu-series, these Gaga: Five Foot Two documentary billboards and these billboards for The Defiant Ones docu-series. And there the you have the winners from another jam-packed year in the sprawling skies of Los Angeles. What do you think of the results? Do you agree with 2017's BAB Award recipients? Here's hoping 2018's city skies will continue to surprise us and fill the streets with jaw-dropping, head-turning, eye-catching creatives that make us all take a second look.